The U.S. 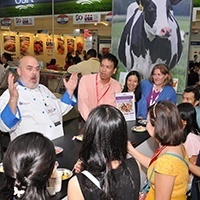 Dairy Export Council® (USDEC), along with four U.S. dairy suppliers, exhibited at the Food & Hotel Vietnam (FHV) 2015 show at the Saigon Exhibition & Convention Centre, April 21-23. USDEC initiated a cheese-focused marketing program in Vietnam in September 2014, and this was the Council's first participation in FHV. Cheese expert Mark Todd, also known as The Cheese Dude, sampled to visitors about 20 U.S. cheese varieties throughout the show and educated them about the long history of cheese making in the United States, which remains fairly unknown in markets such as Vietnam. Importers and chefs alike who stopped by the booth were wowed by the depth and breadth of the U.S. cheese selection. U.S. suppliers Schreiber Foods, Arthur Schuman Inc., Agropur and Talmera Inc., offering U.S. dairy products ranging from cheese such as cream cheese, parmesan and mozzarella to UHT milk, whey protein concentrate and whipping cream, were also exhibiting in the USDEC pavilion and were encouraged by the tremendous interest generated by the Vietnamese trade. "Despite being a country mostly used to eating processed cheese, visitors enjoyed trying different kinds of natural cheese, even blue cheese!" one of the suppliers said. USDEC and the industry it represents look forward to working more closely with the Vietnamese trade to introduce U.S. cheese and dairy products to this fast-growing market. For more information on USDEC's program in Vietnam, please contact our local representative, Ms. Phuong Dang, at PhuongD@prcon.com.